There is a wealth of information about the shape note tradition on the internet. There is no need to try to duplicate all that. The "Links" page will be a start for accessing this information, as will search engines, such as Google. There is some basic information in the flyer on the Natural Tunnel page. I will say a word about the book from which we sing. "The Christian Harmony" was published in 1866 by William Walker and revised in 1873. The book we use is the 1994 reprint of the 1873 revision, and it has four songs added in the back. Scroll down to see a picture of the front cover. Mr. Walker had previously published "The Southern Harmony" in 1835. It is a four shape book. When he compiled the "Christian Harmony" he chose to do it with seven shapes, one unique shape for each tone of the scale. The book is an "end-opener." It's oblong, approximately ten inches wide and seven inches tall. Other shape note books also are oblong. I was told by Hugh McGraw that the reason for this is so that mothers holding their baby could lay the open book in their lap and it would not fall in the floor. Mr. McGraw is recognized for his devotion to the preservation and expansion of the Sacred Harp Tradition. "Sacred Harp" which is a four shape book, is much more widely sung. The seven shape tradition is pretty much confined to Appalachia and in the Southeast; (except for "gospel singing, which is a descendant tradition). This makes it even more important for us to preserve this part of our culture and heritage and carry it forth to those who will help to preserve it by joining in community. A diagram of various seven shape notations. "Christian Harmony" uses the Walker Shapes (last row). "New Harp of Columbia" uses the Swan shapes (third row). There is an "Alabama revision" of the "Christian Harmony" that uses the Aiken shapes (first row). After learning one, it is easy to transition to the others. A closer look at the Walker Shapes. As short history it is; so, well it is to recount it now. There had been an annual singing at Rocky Mount. However, there was not one scheduled in 2007 because the organizer expected that she might be relocating. I decided that I would try my hand at putting one together. I first contacted my singing friends in North Carolina, both to get blessing and to see if I could count on some of them to come over here. I set a tentative date. I then contacted Randy Sanders at the Center for Appalachian Studies and Services at East Tennessee State University, to ask him if they would be interested in being involved with a shape note event. I was pleasantly surprised to receive an immediate and enthusiatic, "Yes! We are very interested!" Randy had just recently been asked by the Director if he thought that the Center might do "something" around shape notes and here was "something." After going through the approval process from the department and the university, we began planning and publicity. They were "old hands" at this, and I was the beneficiary of their expertise. Notice was sent to the university community, a beautiful poster was created by graphics students, and press, radio and television outlets were contacted. We did an interview with radio station WJCW (it can be heard on the "sight and sounds" page). I got the word out to the singing community. 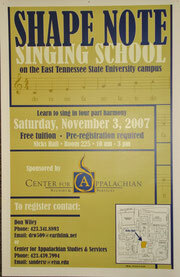 On November 3, 2007, we had around seventy people attend the singing. Here is a video of one of the songs from the day. We began monthly workshop meetings at Munsey Memorial United Methodist Church in downtown Johnson City. 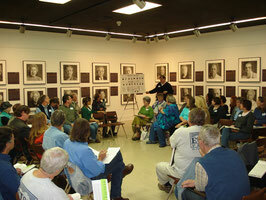 In April of 2008, we moved the to current location at Sycamore Shoals in Elizabethton. We sang in the Reece Museum, which was hosting a travelling exhibit of photographs of Tennessee survivors of the Nazi Holocaust. The small squares next to the portraits are brief biographies of these people. To say the least, it was a unique setting. Dan teaches the class. November 3, 2007. I did not know Quay Smathers. I do know people who knew him and who have carried the tradition to me. I did know Larry Olszewski. He welcomed Julianne and me to our first singing at Headrick’s Chapel, almost twenty years ago. (The chapel has undergone extensive renovations, begun by Larry and completed after his untimely passing.) Memory eternal, brother. We will always remember you, especially when we sing. June Smathers Jolley provided me with a copy of this interview. It was for an oral history project. Q: My name is Quay Smathers and I was born in Dutch Cove in Haywood County in May the 9th, 19 and 13. My mother’s name was Elizabeth Bracken Smathers and my father’s name was Gaston Smathers. And, speaking of the singing, we attended Morning Star Church. And speaking of the singing, the shape note singing, I attended my f irst singing school at about 5 or 6 years old, in the old wooden church that stands up there where the educational building is now. K: Is that where Morning Star is? Q: Where Morning Star is now. And the teacher was Guy Silvers and Herman Tomlin and Guy was a leader and Herman was a deep bass singer. And they came there and put on a 10 night singing school. And we, my Daddy, brought the family up there in a wagon – a one horse wagon. K: How many in your family? Q: There was my two sisters and my father and mother, and I have two older brothers that already knew how to sing and had gone on before me. And we were singing then, sung the shape notes. So I learned to sing then. My mother knew the notes, she learned the notes at a sing when she was a young girl, and she came out of Transylvania County in Brevard. So she would sing them, these songs out of the Christian Harmony when I was settin’ on her lap. K:They used the same Christian Harmony down there that we use up here? Q: The same book, yep. The shape notes come here from England, the English, from England. K: They had them over there? Q: That’s where they originated from because I believe it was said in Shakespeare 1500 or 1600 , during Shakespeare’s life. He said the music will be sung with four shape notes. So when the first settlers came to this country, they only had the four notes, until William Walker put the four more to it. K: They, though had regular notes in the regular hymnals though. What I can’t understand was whether Christian Harmony was something special or just something on the side? Q No it wasn’t anything just on the side – they had no notes. They had nothing to sing by. Only a little songbook with poetry in it. My mommy and daddy remembers going to singing when they just had them little books. I showed you the little book at school, didn’t I? Tha Little Testament and that just had the words in it.There wasn’t no music to it, people just learned it by heart. Now I don’t say there wasn’t music somewhere – there certainly was before that, but the regular do re mi fa so la; the mi fa so la” came from England and William Walker put the rest of the notes to it and made the Christian Harmony Songbook. Now they read it in a different uh, I reckon now that was for singing I’m talking about. K: Do you know why they did that? Q: Now I couldn’t tell you why they did that. They’d sing better of course. So they wrote the book. And William Walker left to go to New York to have it published – there wasn’t no publishing done in the south. Now this is something I didn’t learn for years – is that trip to, to get that book published, he come in contact with some feller, I believe it was in Massachusetts or somewhere, and he left his brother-in-law out of it, double crossed him. Now the people that sings out of the Christian Harmony don’t realize that, but I learnt that. So Benjamin Franklin White left Spartanburg County and went into Alabama, Georgia maybe, part of it – I believe in Georgia, and spread into Alabama and he is the publisher of the Sacred Harp. And they were brother-in-laws. And the Sacred Harp spread through Alabama, Tennesssee and the lower part of Florida and the Christian Harmony remained up in this section up in here. K: What county are we in right now? K: And where is Spartanburg? Q: Spartanburg County is in South Carolina. And William Walker, he rode through this country, teaching singing schools and selling his books until the year – I don’t remember what year he died. .His songbooks and his pitchpipe is in the museum down in Spartanburg. K: Did your father learn, go to a singing school that William Walker…? Q: No, I don’t know of anybody that went to William Walker, except I know of one man that went to William Walker. K: And who was that? Q: It was preacher Benjamin Clark and he was the one that taught my mother to sing in Transylvania County. And he moved to Haywood County up on Pigeon River. And raised a big family and there was three boys. One boy made a preacher, and his name was Will – he was one of the greatest. He had another boy named Wilbur. The youngest boy’s name was Lyman, which I guess was the greatest Christian Harmony singer there ever was, that ever been…And he had about two or three girls. And I sung with them and then their grandchildren. On Pigeon River, 20 years ago, there were more Christian Harmony singers gathered together than any one section in the country. K: Was that at a church? Q: It was in the community, at a church. K: When did you first start singing shape notes? Q: Back when I first went to singing school, I certainly didn’t sing out of the Christian Harmony songbook. I learned to sing shaped notes out of some of those gospel songbooks – Stamps Baxter I believe we used up there and James D. Vaughn, A.J. Showalter, B.E. Winset and that was some of the publishers that was publishing paperback songbooks and hymnals for the church. The singing school I went to wa out of one of them somgbooks. K: What was the singing school like? They were at night? Q: They were at night. Q: Well, about, they lasted about four hours they had about 10 nights of it. K: And this would be in the summer? Q: Summer, yes. In the summertime. K: And he would be the main leader – how would he teach you? Q: He’d have a blackboard and he would write up the staff and write the scale down and put the notes on there and start out with just ‘do re mi, fa, so, la, ti, do’; and over and over and over and over until you learned the sound ‘do’ or learned the sound ‘re’and the shape of it and when you saw it you knew what it was. And that’s where I learned to sing the notes. K: Did you have to pay for it at all? How much? Q: Oh well. I guess maybe back at that time they taught ten nights for $25 or $30. K: And how many people would go? Q: Well, maybe 40 or 50. Q: All ages. The whole community turned out. They turn out for it. Then there wasn’t any more singing schools that I went to or any that were around Morning Star. K:Did you just go to one singing school. Q: At that time, yeah. K: And what year was that? Q: Oh that was about 19 and 19, I guess, maybe somewhere in there. Then in 19 and 39 we decided at the church up here that we’d have another singing school. I was appointed one of the to hunt up a singing schoolteacher. And we found one – a Miss Terry Wilson, from Asheville and I believe was one of the greatest ones I’ve ever gone to. And she taught ten nights up here and then she went on. She taught in Haywood County, I probably, but that whole summer from one church to another. And I’d followher through about 10 or 12 different singing schools.
. K: Who would have paid for her to do it? Just the expenses that people paid? Q: Right at the church. Each church would pay it. And then she’d go on to a community. And the Methodists would have her at their church for 10 nights and the maybe the Baptists would have her. The Baptists would come to the Methodist church and the Baptists would have her for 10 nights. And they would go to that church, but they would have 10 more nights of advanced – a little bit higher on up – a-getting into, you know, some pretty complicated singing on the scale. What you went through in only 10 nights was just regular old scale – learn you how to sing, you know. So I spent practically the summer with her. K: How old was she? Q: I guess she was about 35. K: Do you know where she learned to do this? Wasn’t that pretty young to be doing that? Q: She was a a music teacher. During all this time we’ve had singing school teachers through the country. Had Asbury Smathers – the one that I learned to sing from. K: What relation was he? Q: All Smathers are akin – they come out of the Dutch Cove. So I’d go up to his house when I was a young boy, I guess about, before I was married, I guess I was about nineteen years old. And wasn’t nobody there but him and wife and they were real lone. And he taught me how to sing out of it. And me and him would sing and she’d listen to us. K: The two of you? Q: Just the two of us. And I learned to sing right there. We were singing out of the Christian Harmony – no previous experience had I ever had out of the Christian Harmony up until that time. But, I could still sing the notes, see. And that’s the way I first, where I first started singing out of the Christian Harmony. K: Would you go up once a week? Or how often would you go? Q: Maybe three or four times a week. K: How come you were interested in it? Were your friends interested in it? Q: No, they was out loafin’ somewhere. I don’t know how come – I was just interested in it. I’d always like to sing. I sung in a quartet for several years – a gospel quartet. But, I was just interested in learning to sing out of the Christian Harmony. So several people found out I was. They gave me books see. When he was about on his deathbed he got up and went over and got his songbook off the mantle and said I want you to have this. I’ve got songbooks – I had one songbook that was mailed to me from Florida, that on account I was keeling the Christian Harmony alive. And after this past Old Folks’ Day up here, I got a call from up on Pigeon River – feller I knew. He had read about it in the paper, and he had his Daddy’s songbook there and wanted me to come and get it. So I gathered up – I have fifty six now. And I gave one to my niece, which is a music professor in Pasadena, Texas, and she prized it. And I gave one to Mrs. Edith Card, which played the piano. And the rest of them I have. And they’re just a prized possession – there’s few of them left through the country, people just don’t part with them. There’s several through the country, the old ones, but you can’t have singing out of the old ones any more cause there’s just not enough of thebooks – they’re just collector’s items. K: Well what songs did you – or were there any in particular that he sang? Q: Q: The first son I learned was “True Happiness”. Q: From him. That was the first one, then we’d try another one and then just one after another one. K: Did you try to memorize them after a while? You’d always use the book? Q: Not very many – I never could memorize too much. I can sing them, but I always use the book – to do the singing with – never could memorize too good on ‘em. But, then back about 15-20 years ago, we had the new Christian Harmony published. So that’s what we’re using today. K: When did Old Folks’ Day start? Q: 88 years ago down at Locust Field. Q: That’s Locust Field Church down in Canton. K: Well, then, what was the purpose of the Old Folks’ Day – it wasn’t just for the Christian Harmony? Q: No – they met up there to sing out of the Christian Harmony and then they called it Old Folks’ Day, see. That’s how come it. I think it’s 88 years… The reason you have them over at Etowah, that’s the Etowah singers come to Morning Star and everybody comes to Morning Star up there on Old Folks’ Day, it’s families that gather in. K: It seemed to be a lot smaller at Morning Star, like not as ,many people..
Q: Yeah…while over there at Etowah, they come to sing and they’ve got no other place to ___...what I got started to say, when they come in up here it may be some families’ daughter come in or maybe somebody’s niece or somebody’s children come in or some of the ____are gathered in. More or less a family reunion and it’s more benefit to them to stand out there that little length of time they have to talk, than it is to come in there and sing. Now that’s the reason. And over there at Etowah there’s a singing convention. But the Christian Harmony singing up here is older than the one up at Etowah. Morning Star…Now the one at Etowah has had more singings. They’ve had two a year. Q: The first Sunday in May and the first Sunday in September..
K: Now they weren’t always where we went – it was at a school or something? Q: Yeah. It was at a school, but it didn’t start there. It started over there at a little church, called the Etowah Methodist Church. Well it began to expand and a new generation came along and they throwed the Christian Harmony singers out. Q: How come, I don’t know. People just never did like to listen to it…And back 35 years ago, the Christian Harmony singing had just about died out at Morning Star. When I first took over, there wasn’t but about 3 or 4 singing. And I took over and I just kept…..
K: What do you mean, when you took over? Q: I mean, I just saw it was a-going to die out. K: And so you started going around to people?. Q: Yeah, I just started learning about this one and that one. And going to singings other places. Q: Uh, well, I had no other place – well, went to Etowah. And then I went upon the Pigeon River where the Clarks were, see. And I sing with them, maybe once a month. And they learned me, and they learned to come to Morning Star. And that’s made up of quartet singing up there. And it took me 15 years to get that – to get them to understand that it was Old Folks’ Day – the Christian Harmony singing. Not been bothered with a quartet up there, I guess for 20 years. Cause it was Old Folks’ Day – it first started out as Christian Harmony singing and they turned it into Old Folks’ Day. And there’s not many of the old people left. That I call Christian Harmony singers that is left. My uncle is up there, he’s 98. K: And who are some of the others? Q: Well, Dollie Smathers, she was there (describes where sitting)…Now that’s two of the oldest. Leonard Westmoreland down here, he went to singing Christian Harmony after I did. He’s a good singer. Bill Barres, he’s one of the oldest. Mr. Morgan, that passed away – do you remember him? (I, Kate try to remember while Quay tries and describes)… well, he was up there…he was 91. Well now, he passed away two weeks ago and he sung Christian Harmony. He knows hisself that I helped him, that I taught him. I mean he’d tell you that if he was alive today. He’s made the statement several times that I was the one that stood by him and kept him held up while he learned to lead and he learned to sing out of it. There’s not but a few old ones left. I don’t count myself as an old time Christian Harmony singer, although I am. They had a sound in their voice that’s different from what I have what anybody else has – these old folks did. Different accent in their voice. Two of the greatest singers I know of, probably three – Mr. Moss is a good singer, he’s one of the best. K: How would you consider him an old time…? Q: I consider him an old time singer. He has the expression now, do you understand what I mean? Lee Black from ______ South Carolina – he was one of the greatest leaders I ever knew. I’d put him ahead of my personal _____ and ahead of most any of them. K: Did you go down and see him or was he up here? Q: He come to Etowah, he come to Morning Star. And I’ve been down to his church and sung. And he’s passed away. K: Where’s Mr. Moss from? Q: He’s from between Murphy and Franklin, in a section of Makem or Clay County. But all these singers up there – Uncle George Smathers, my uncle, and I’d say I don’t know any at Etowah, might be two or three, that didn’t come in after I started singing, Since I started going over there. They’s not many of the old ones left. K: What are some of your, well, some of the favorites, or ones that are sung the most? Or are there ones that are sung the most? K: Any particular reason why? Q: No, I don’t have any reason. I mean, everybody has their own songs they get up and lead. And they’re all good. K: These are ones you like to lead? Or those are ones you like to sing? Q: No, those are ones, I like to sing them and I like to lead them all, but I’m especially fond of them two. Most every leader will have him a song that he will lead. And through these conventions, I mean these singings, people sometimes lay off of some old man’s song because he likes to lead it. “In That Morning” is a good song – I like to lead that one very well, but my uncle up here, which is 98, it’s his favorite song, so I don’t bother to _____ when he’s singing. He likes to lead it. “Pisgah” is another good song. They’re all good, but every leader has his own song. K: Are there certain ones you remember from certain singings? They were the first time you sang them maybe? Some that are always sung? Q: Yeah, Mr. Morgan that died, his is “Faithful Soldier” – he led it every time. And I don’t know of any other particular, well I would, but I wouldn’t know which to say, but they’d always have them a certain song. Leonard Westmoreland sings that “Indian Convert”- he leads that all the time. K: The things at Morning Star or Etowah, were there certain formalities thathad to be followed, like you’d start or the oldest person would get up and lead then go to the youngest? Q: There was no formality at all that I ever remembered. The only thing, I’ve been vice-president at Etowah, I guess, for 20 years, 18 years maybe. Q: It means that Bill Mathews is the president of the convention and I was vice-president. And if he wasn’t there, I took over. I’d always have charge in the morning. He’d take charge in the afternoon. Sometimes. He’d take charge in the morning and I’d take charge in the afternoon. In other words, I was in charge of the singing over there. Of course, I’ve been in charge of singing up here (Morning Star) dor, I guess, 35, 36 years. K: Okay, why don’t you talk about how you would pitch a song? I remember you once talked about that, you had a special fork? Q: Oh yeah. Had a tuning fork. Yeah, the old folks had a tuning fork. K: And what was it like? Q: It was a fork with a bar slid up and down on it. And if they wanted to slide it, pitch it in G, why they slid this bar down to where it said G there and pecked it on something, and held it up to their ear. And, that’d give them their ‘do’. That gave them their ‘do’ note. And that’s something that’s rare anymore. You can buy the tuning forks, but they’re only in one key – an A key or something like that. When I sang regular, I would, the leader would go right through and find the highest note that he could reach. And he would pitch from that note and bring us down to his ‘do’. Then, some of the bass singers – Lyman Clark, he would pitch his low ‘do’ where he could get his lowest good. And he could always get it right. But that’s the way they pitched a song. And now they pitch ‘em with pitch pipes which is more accurate than that. But back then they didn’t have pitch pipes they had to pitch with a tuning fork, but very few of them. K: And would always go through and note out the song first, even if you knew it? Q: Yeah, oh yeah. Sing the notes. K: And then, I’ve heard people say, and then they’d say, sing the poetry, is that how you use to say it? Q: Yeah, they might say, let’s sing the characters, one old man would say and we’d sing the notes. And then we’d sing the words. K: Now, were there very many women that got up and led – was it mostly men? Q: No, mostly men, some women led, but mostly men that led the songs. I don’t particularly remember very many women leading. Q: Oh yeah. They all participate. And they all sang the treble. And I made the statement to you before, there’s not very many alto singers in my lifetime. My mother sung alto. There was two or three women, that used to come to Etowah that would sing alto. And Aunt Judy Haines, which was a heir of the Ben Clark family, she was an alto singe. But the old women would sing the treble. A lot of women, but there was never many alto singers. K: Would you say you’ve sung every single song in the Christian Harmony book? Q: Oh no, no, no. I’ve never sung – I probably have here at the house – back to back. But to get up and say I’ve sung every one of them, I never have. K When you say in the house, you would sit with the book and just go through them? Q: Oh yeah, yes, yes. Well, I should have kept on, that’s the reason I get hoarse so quick – don’t sing much. But what you already know, it’s no fun to sit back and sing, you see. It’s that that I didn’t know what I was working after. I don’t believe there’s a song, any song written in shape notes that I can’t sing, three or four times try. That was why I say I guess I’ve sung about every one of them, gone through about every one of them in there. Problem there was, it was no benefit to me to sit back there and sing one I already knew, so I’d go through the book and pick out some. Some of them good, some of them better than the other. K do you know the difference between the shape notes and the other kind of notes? Q: I’ve never been exposed to it too much. I used to play a tuba, and of course I learned to play by lines and spaces in round notes, you know. But to take one and sing by it, I couldn’t at all. Unless I knew the song, I wouldn’t know where I was going. But I can take the shape notes and learn any song that’s written in shape notes. K: Are some of these (Christian Harmony songs) new ones? Do you know how old some of these songs are? Q: Yeah, these in the new book, are lots newer – certainly. Q: They’re not Christian Harmony songs. No they’re certainly not Christian Harmony songs. They’ve put a lot in there. K: So what you would have to do is go get one of those old books and those are the Christian Harmony…? Q; That’s the Christian Harmony songs and those songs that have been put in there (points to the new book) are songs I don’t approve of. K: Well, who, how would they have gotten in there? Q: John Deason, and Parris, they that published – they took the Christian Harmony Songbook and they picked out – well, I tell you, I think it was Carl Anders which was president of the Etowah convention got it up over there, he went down there and he made out a list of all the songs that was sung the most at Etowah. And they put them in there, in order to make the book larger – they added a lot of songs that come out ofthese gospel songbooks. K: How can you tell the difference? I mean, somebody like me, who was just coming in? You just know, through the words, through the tunes? Q: You can tell through the words and of course you wouldn’t know it unless you knew the songs out of the old Christian Harmony. But the songs out of the Southern Harmony, which was the four note, the ____ of the Christian Harmony are all in there. And it was a little bit smaller book – they added a lot of songs to it that the Southern Harmony had, and made a large book out of it – not too many more songs, now, but they were all in there in four notes. But that’s all we’ve got left to sing out of and I think what, some of these songs were sung – you’d hear the people sing them over and over and over and over and bring it on up and bring it on up and everybody sung ‘em like that. And then over there, Sitton Allison, I think he’s missed about 5 or 6 singings – and he told me over there at Etowah last year, that this new bunch had added something else to Christian Harmony singing because they was singing it like it was laid down in the book. And that’s the reason I tried to teach it just like it was laid down in the book. And that’s the reason I would over run it myself – lots of times I’ve sung these old songs over all these years. And you get ‘em built up in your mind, and you come to a rest or a whole note, you just go right on, you go on over it, because that’s not the way you sung it, that’s not the way you heard it. You heard it some other way and it’s been handed down from one person to another. And you get that built in you, then you’re going to overrun a rest, you’re going to hold a note where it shouldn’t be held. And that’s what he meant. He knew music and he said it added a little sweeter taste by singing them like they’re supposed to be sung…There’s not but one song that I think, can’t think of the name of it. But there’s one over there that David (Holt) wanted to sing and we sung it one time – “Not Made With Hands”, you know. It’s a good song, but it’s not a Christian Harmony song. And I don’t have no objections to singing ‘em, but I just have a feeling for the Christian Harmony songbook. Ones we sung over there – “Holy Manna” is not in the Christian Harmony, which is a good song/ “Not Made With Hands” is not in the Christian Harmony. There’s so many in there , let’s see “Tempted and Tried”, you know, that’s not in the Christian Harmony Songbook. I sung that in a quartet when I was singing in a quartet – that song don’t date back many years, but it had no business in there - “Twilight Is Falling” which I sung which I sun when I was a young kid in the Devotion old one room schoolhouse. And stuff like that is in the songbook and they’re good songs but they’re not supposed to be in the Christian Harmony songbook. K: Did anyone ever come and want to tape you? I mean, tape a singing? I don’t know – maybe some big businessman want to come and make a record? Q: Oh yeah. Artus Moser Taped us and put it in the Library of Congress way before he ever sung out of the Christian Harmony songbook. He’s the first man that ever taped us at Morning Star. He wasn’t even a-singing out of it then. K: He just heard of it, and came out to see? So he’s a newcomer, really? Q: I would say he is. I mean he’s a newcomer in respect of how long I’ve been singing. No, we’ve put on a television program in Spartanburg County. K: Did you just get some friends and things and went down? Q: Mrs. Edith Card arranged it and put us on the television down there. Q: Oh, how long ago has that been?It’s been ten, twelve years ago. Put it on television and we went down there. She more or less hand-picked the ones that could go, you know. K: And how many went? Q: I don’t know. I’ve got a list of it in there. About ten of us maybe and everybody got a chance to lead. My brother, which passed away, he was, he sung out of the Christian Harmony. He passed away about two years ago. K: What was his name? Q: Vaughn, Vaughn Smathers. Me and him went to Etowah all the time. I would go by and get him. And I remember when I was the youngeST Christian Harmony singer in Etowah for years. Q: Oh yeah, they come from the Chapel Hill after Old Folks’ Day. Chapel Hill – educational T.V. They came and made a T.V tape at Morning Star. And they showed it, I believe on the 18th of December on Educational T.V. K: Did you watch it? K: Where are some other singings? Q: Well, I did a workshop down in Marietta, Georgia and I run into a whole bunch of shape note singers. And they were singing out of the Sacred Harp. But I had carried mu Christian Harmony songbook along. And they were good singers. Now, out in Denton, Kentucky, they have, once a year. I got an invitation to come – I believe it’s Denton. They still have these Southern Harmony singing. Well, now you said you went down to Knoxville, didn’t you? There’s a lot of it, of shape note singers down there. And down in Alabama and Georgia, they have, I guess, one a month conventions. Mr. Deason sent me a folder of all the convention od the Sacred Harp and the Christian Harmony conventions for the southern part of the country down there, in Alabama, Georgia, South Carolina. And there was a convention going on just about every Sunday, all year long. K: The only time you would usually sing these were at the Etowah conventions as you call them or at Morning Star – the first Sunday in May and then the first and second Sundays in September, and that’s the only time you’d sing them? With a group of people? Q: That’s the only time about now, but back when I wa first learning to sing, several years back, I was singing about once a month. K: Just at different churches? People get together at night? Q: Yeah, go down to different churches or yeah, we used to sing at least once a month the year around. Come the Clarks were alive up on Pigeon River, and then we used to go to different churches and sing. K: And when you say we, you mean the people around here? Q: Yeah, the people around here, go together and sing. K: Oh, so it’s really changed a lot now? Q: It’s changed – they’re just not singing it. But like I said, a group, like yourself that’s coming on, that’s really interested in it and like to sing it, maybe it’ll pick back up. K: Well, why do you think – it seems to be a whole lot of older people and then all these young people and why aren’t there any people in the middle around there that are interested? What Happened? Q: They just don’t want to sing them. They don’t even want to set and listen to them….you saw how it was up at Morning Star. Of course, more stayed in the house this year than ever have, but people just don’t like to hear it, I don’t know why. But, there’s more young people taking an interest in it now than there ever has. Took interest in the Christian Harmony singing. K: Do you personally feel that it has lost anything either in meaning or form today from the old singing? Q: Expression. I sure do. K: That’s in the quality of the voice? Q: The quality of the voice and the way, the expression of the voice. And the expression and the speed. Lot of them want to speed – the songs are made to sing slow. That’s the reason that I always thought that Lee Black sung the nearest to perfect…now he was perfect on every one of his songs. But the most people want to get too fast with them. Just like, I was singing down at Union Grove. I sing down there every year ata convention on Sunday morning. I told them – John McCutcheon, he’d got up there and I told him, I said, let’s take the bluegrass out of it. The songs are just not made to run away with. They’re just made to sing slow.